Orbit Fun Center sells roller skates. No matter how you like to roll, we have your gear. We have skates for children, teens and adults. Why buy from Orbit Fun Center? We know you and you know where we are. If you have a problem with your skates, we can fix them right on site, no shipping necessary. Get the right skates the first time. We know how you skate and what you need, give us a price range and we will find the skates you need and want. We carry all the gear, from the hottest wheels, plates, bearings to complete skate packages, skate bags, protective gear. While you might pay a bit less online, you don't get the service and personal attention you will receive in our shop. 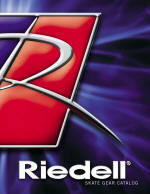 Check out Riedell's interactive catalog and stop by the rink to get a great deal on skates.